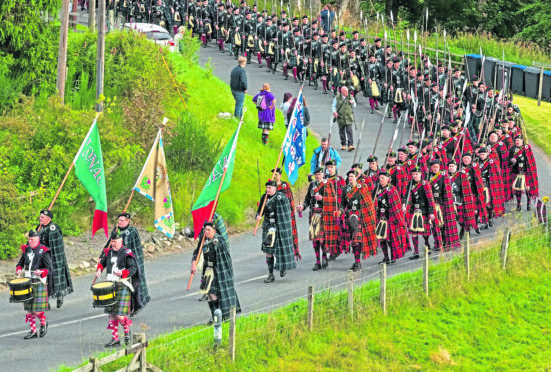 Clansmen march through the glen from Bellabeg, on their way to the Lonach Highland Gathering. Hordes of tartan-clad Highlanders are descending on the Lonach Highland Gathering this weekend. A chance for the community to come together, the Highland Games combines sport and culture in towns and villages across Scotland. Always held on the fourth Saturday in August, the day of The Lonach Highland Gathering begins with the March of the Lonach Highlanders who depart Bellabeg at 8am before marching around the arena in the afternoon. Jennifer Stewart, secretary and chief executive of the Lonach Highland and Friendly Society, said: “Saturday’s annual Lonach Highland Gathering and Games will see the usual mix of events taking place. There are all the traditional events including piping, dancing, light and heavy athletics and tug o war, plus children’s races, a hill race, around 70 trade stands and a funfair to keep visitors of all ages entertained. “The highlight is always the march of the Lonach Highlanders, a stunning spectacle that visitors from all around the world really enjoy. It is unique to Lonach and can’t be experienced anywhere else. There are often a few tears in the crowd as the lads march past. Following the Highlanders is Socks the horse, who is making his fourth appearance at Lonach and he is always a hit with the crowd. What other Highland Games are on this summer? On September 1, the spectacular event will transform the village of Braemar. Known for its attraction to the royal family, who are often in attendance, the gathering attracts spectators and competitors from all over the world. Held on the first Saturday in September in The Princess Royal and Duke of Fife Memorial Park in Braemar, the gathering has been running since 1832 but has been held in one form or other dating back to the days of King Malcolm Canmore 900 years ago. Seems pipes bringing fun to everyone since forever. Taking place at the Recreation Ground in Pitlochry, these games will take place on Saturday September 8. The community of the town and visitors will be able to enjoy all the usual events and you can even take along your well-behaved furry friend as dogs on leads are welcome. Take some time to explore the picturesque town while visiting.